The brief but brilliant career of legendary racecar driver Ayrton Senna, arguably the greatest F1 racer of all time, is recounted in Asif Kapadia’s Senna. Comprised entirely from stock footage, this documentary eschews the talking heads of most films of its type. Instead, Senna’s story plays out over a series of expertly assembled, sparsely narrated clips. What results then is less new insight into the career of a man whose drive for perfection drove him to destruction than a reminder of what an incredible run he had. Kapadia has made Senna, perhaps predictably, into a hagiography. The film unambiguously views Senna as a trailblazer in the F1 world, and sees his risky on-track action as an advancement of the sport. He is portrayed as an outsider to the sport and a repeated victim of questionable league politics. “I was fucked many times by the system,” Senna complains, and the film never argues that his controversial driving style of trying to close gaps that other drivers would not might have been reckless. Further intensifying the director’s admirable stance toward Senna is the focus on Senna’s status as a man of deep spiritual belief and great national pride. The driver’s Brazilian roots are underscored time and again, and Senna’s win of his first Brazil Grand Prix (despite a broken gearbox!) is portrayed as perhaps his greatest moment of pride. No great hero rises without a great villain, and Senna found a true rival in Frenchman Alain Prost. The number one driver on the F1 circuit when Senna burst onto the scene, Prost soon found himself Senna’s reluctant teammate. Their year together on the McLaren racing team sparks a bitter competition that comes to a head when Prost drives into Senna (possibly intentionally) during a Championship race in 1989. The scenes detailing the Prost/Senna relationship are the film’s best, even though they only show racing fans what they would have already seen in sports media. Still, Prost, in his many scenes, provides Senna with a better villain than Nigel Mansell’s computerized car does later on. Perhaps inevitably, given real world events, as Senna speeds toward its last half hour, it turns a bit ghoulish. The fateful 1994 crash that ended Senna’s life is treated portentously. After the series of triumphs that has comprised the film to that point, this sets up a somewhat depressing finale. This feeling is compounded by the general lack of perspective given about the causes of Senna’s crash. Again, the film’s unquestioning allegiance to Senna’s on-track brilliance might obscure the question of whether or not he raced safely. 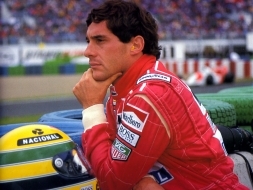 Still, Senna is a solidly constructed sports documentary that is genuinely rousing at times. It has been assembled with the obsession of a true fan and seems capable of converting even those who have no idea who Senna was going in.